Emergency Chronicles fills a void among the available scholarly works covering the period of what was an ‘aberration’ in Indian politics. In this riveting work of impressive archival research, Gyan Prakash lifts the curtain from the evolutionary sequencing of events leading to June 1975—the day Emergency came into force—and uncovers the everyday governing apparatus of a then proto fascist—if not a full blown fascist-government reigning for two dark years ending in 1977. This perceptive work is like a missing piece of a puzzle from the history of modern India’s politics, enabling one to make sense of the most senseless times in India’s political lexicon. The author has woven the arrest of Prabir Purkaystha from the old JNU campus down to every known horror story of the Emergency that saw itself through the print. Readers should especially lookout for the account of the letters exchanged between Pramila and Madhu Dandvate—an undoubtedly rich and personal account of the traumatic period. 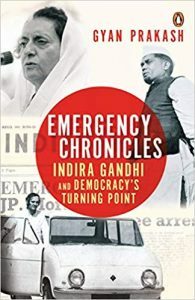 At the very outset the book lays out what it set out to achieve—running into nine chapters—to question and unpack the very misconception of Emergency being considered a sudden outburst of a cornered Prime Minister. Gyan Prakash argues that the logic of Emergency is not very difficult to comprehend if one locates it in the very unfolding of the procedural democracy in postcolonial India, whereby he underlines the contradictions of India being a ‘pedagogic state’ which is far removed from the social realities of the country and aims to coach its people on how to be ‘productive citizens’. This line of argument, that India being a liberal progressive state imposed on a highly illiberal society, which in turn is highly divided by the rigid identities of caste, religion and region, has been explored elsewhere as well. However, the perspective formulated in the Emergency Chronicles, that the very idea, envisioning India as a highly centered and powerful state donning a pedagogical superiority over its own people contained the seeds of the discontent, which eventually led to the Emergency, is insightful. Drawing the readers’ attention to the idea of a nation-state, the work reminds us that India has never been a ‘nation’ in the western origin of the term. The country was constitutionally nationalized and administratively unified to build an idea of a nation where the voices of the marginalized and oppressed will not be silenced and rather will enable them to express themselves freely. Gyan Prakash emphasizes that the idea underlying the making of a nation out of India, rooted in Saadat Hasan Manto’s critique of a nation emerging out of the communal divide and Ambedkar’s conception of a state against caste inequalities, poses a serious challenge to the unity of the nation-state. The only way then, to firm up a unified country battered by religion and caste, was to ensure that the violent forces challenging the constitutional order would be controlled and sensitized about the Constitution through a strong state alone. And thereby begins the conflict between the Leviathan and the ‘unruly masses’. The work succinctly captures the now text-book conflict between the judiciary and the executive in the background of the days leading to the Emergency, showing law as the ‘terrain of political conflict’ between the ruling and opposition political parties. Through its meticulously layered analysis, the author takes us through the varied political posturing of parties, far removed from the constitutional scruples in the name of parliamentary ethos. We are served a fascinating account of how constitutionalism was sought to be defended by distortion of procedures laid down in the Constitution. Two chapters in this work of exceptional scholarship deserve special mention, namely, ‘Lawful Suspension of Law’ and ‘Bodies and Bulldozers’. While the former traces the intricate history of bending the legal and executive powers of a state under Emergency, all in the name of defending the law, the latter questions the postcolonial development project of the Indian state, the most blatant side of which got unleashed in the same period—not to say that it was ever questioned in the pre- or the post-Emergency period. The book is a sombre reminder of the dark and haunting period of the Emergency and leaves readers wondering whether in the light of the very many injustices done to the citizens by the postcolonial state they can be really counted as a truly constitutional democracy. But then democracy is just one of the myriad ways through which politics becomes tenable. The case of Indian democracy is also—if one looks at the brief history of postcolonial democracy—one of a continuous battle of politics making itself valid through constitutional overreach, putting a labouriously built constitution to jeopardy innumerable times. However, one question which remains unaddressed in this work is why Indira Gandhi, the then Prime Minister, decided to revoke Emergency in January 1977. It is plausible that witnessing the rule of impunity and of extreme brutality all around forced her to rethink, but again these are all conjectures which need to be probed and analysed and as the author admits, could be better studied, once her papers become public. Another question that is far more difficult to answer, however, is a question which, India’s political class can ignore at its own peril. That is the question of justice. The idea of justice gets consistently ignored by the structures of the Leviathan. Perhaps it is in the very nature of the Leviathan to rubbish the claims of justice in order to validate itself. Either way, in the year 2019, let us not forget that those who got away with their crimes committed during the Emergency still write ‘Every Vote counts…’. The joke is actually on us—us the sovereigns. Moggallan Bharti teaches in the School of Development Studies, Ambedkar University, Delhi.